Want your tired eyes to look 10-years younger in about an hour? Also known as a “lower blepharoplasty”, the Lower Eyelid Lift procedure removes the “bags” that protrude under the eyes. These lower eye bags lead to problems like constant puffiness, wrinkled skin, and a drawn, tired appearance. And what is the result of this wonderful procedure? A very well rested, youthful, and natural look! 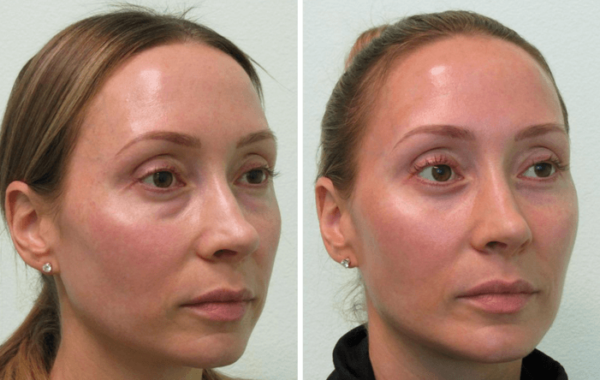 The Lower Eyelid Lift Las Vegas treatment is a very delicate procedure in which Dr. Lanfranchi takes extra time and focus to ensure that the final result is flawless. Often the lower blepharoplasty procedure is combined with other facial procedures to help restore youthful life back into one’s overall appearance (see TLC Premier LiftTM). What is a TLC Lower Eyelid Lift? Dr. Lanfranchi uses advanced surgical techniques to produce age-defying results that remain completely natural-looking. The outpatient procedure is done under local anesthetic and usually takes about an hour to complete. A small incision is made within the natural creases of the skin allowing Dr. Lanfranchi to readjust fat pads, remove excess skin, and tighten underlying muscles between the lower eye and cheek. Lower blepharoplasty is the ideal procedure for patients who would like to address under-eye bags or deep, dark hollows below the eyes. After the procedure, the application of makeup will be easier, and the eyes will regain their youthful appearance of the past. Lower eyelid surgery is a long-term procedure, and most patients only need one in a lifetime to look years younger! Are You a Candidate For a Lower Eyelid Lift? Lower eyelid aging usually involves one to three issues to consider. The first concern is constant “puffiness” (i.e. the “bags”). The second topic is the quality of the skin (i.e. wrinkling). The third is the relationship of the lower lid with the upper cheek area. The combination of these three determine which treatment(s) will be best for you. As mentioned, lower eyelid bags can be flattened with a lower blepharoplasty. Excessive wrinkling of the lower eyelid skin is usually best treated with a fractional CO2 laser treatment (for clients with light to olive skin tone). Lower eyelid and upper cheek hollowness are typically best treated with either soft tissue fillers or fat transfer. One or two of these procedures can be performed together if needed. Many times just one of these treatments is enough to give a great result! Dr. Lanfranchi will discuss with you which will provide the most benefit based on your desires and exam. This treatment usually has one of the easiest, and shortest, recovery periods. Recovery can be as fast as 3-4 days for many patients! When indicated, the Lower Eyelid Lift Las Vegas procedure can be performed in clients as early as age 35. Many patients choose to have an upper eyelid lift with their lower eyelid lift in order to make their eyes look the youngest as possible. Ready to learn more about a Lower Eyelid Lift? The first step is to come in for an in-person consultation with Dr. Lanfranchi. Please fill out the form on this page to request a consultation or call our office directly at 702-929-3880 during normal business hours (please leave a message if we are unable to answer). The Lanfranchi Center serves the Las Vegas and Henderson, NV areas.